When it comes to education, Grove City faces the same challenges as many other communities: space, funding, safety and quality programs for educational advancement. Yet, by working together with the public and private school systems and select colleges, we provide potentially transformative solutions to these challenges. It takes a village – or, in our case, a city. We have a tremendous responsibility as city government to leverage community resources and local partnerships in support of high-quality learning environments for our children and to provide options for continued adult education. Recognizing the important role a community plays in the education and well-being of our youth, the Parks and Recreation Department provides a multitude of learning opportunities. Programs are designed to nurture development beginning as young as 18 months old, including sensory growth, playgroup activities, academic learning and creative exploration. Before- and after-school programs extend learning beyond bricks and mortar, with activities known to increase community engagement, improve classroom performance and develop positive influences. The City’s Development Department considers the future of education in Grove City with every new housing proposal. For example, a preliminary development plan for the Farmstead Subdivision, located west of Jackson Pike between Borror Road and State Route 665, was approved by City Council, after the developer met the City’s request to reserve acreage within the subdivision for a future elementary school. Our community is home to a large number of South-Western City School District’s more than 22,000 students and the City takes the needs of the district quite seriously, including ballot issues. At a council meeting in 2018, we unanimously resolved to support Issue 7, a no new millage bond issue needed to rebuild the district’s four oldest middle schools, renovate and construct an addition on Jackson Middle School, as well as other construction projects. The bond issue passed Nov. 6. Safety, security and substance abuse education remain a priority for the community. In addition to public safety educational training through programs such as Grove City Citizens Police Academy and self-defense/situational awareness education, the Division of Police continues to work with local schools, funding programs such as on-site school resource officers and D.A.R.E. (Drug Abuse Resistance Education). The Grove City Higher Education Investment Program encourages residents to further their education and remain Grove City residents. Providing tuition assistance to full- and part-time students attending specific accredited higher learning centers, this program is a benefit for individuals seeking educational advancement. The Grove City Area Chamber of Commerce provides several educational opportunities for members. Its Southwest Community Leadership Program teaches leadership skills and educates individuals about opportunities to serve the needs of our community. In addition, the Chamber Foundation provides scholarships and support programs, enhancing the skills of local employees and the overall Grove City business community. Grove City is not unique in its desire to support the education of its residents; nor are we unique in the challenges faced through such endeavors. However, we ARE unique in our commitment to push through those challenges and involve the entire community in our efforts. Never before, and not since, has one room seen so much life, laughter and learning as the one-room schoolhouse. The Village of Grove City and Jackson Township had several one-room schoolhouses, most built in the early 1800s. Getting to the Orders Road School (located a quarter mile from Harrisburg Pike) meant children walked as far as two miles through all kinds of weather, carrying their lunch pails and learning materials. During colder months, it was not unusual for them to also carry logs to school for the stove to keep them warm. Perfect attendance was rare at the Orders Road School, as harsh weather often kept children away. Children of the school’s farming community would often stay home to help with chores. When all lessons were successfully completed through eighth grade, an exam was administered for graduation. There were no high school classes offered in Grove City until 1894, so passing students who wanted further education would go to a private academy or take an entrance exam for a college or university. The one-room Orders Road School was constructed on property that was carved from 140 acres of land owned by Allen and Mary Orders and deeded to the Jackson Township Board of Education. After providing shelter to three generations of students, the last lesson was taught in 1928. Now a historic landmark in Century Village at Fryer Park, the Southwest Franklin County Historical Society provides tours of the building where you can experience life in the one room that so long ago brought children together in learning and laughter. To schedule a tour of the Order Road School, call the Southwest Franklin County Historical Society at 614-277-3061 or visit www.grovecityohhistory.org. Roby Schottke, Ward 4; Christine Houk, Ward 3; Steve Robinette, President, At-Large; Jeff Davis, Ward 2 and Ted Berry, Ward 1. The Grove City Division of Police is accredited by the Commission on Accreditation for Law Enforcement Agencies. This recognition demonstrates the division’s commitment to adhering to the highest standards set forth in policing. The staff works diligently to fulfill its mission to serve and protect all by providing professional law enforcement services and education in partnership with the community. The community aspect of this mission is evident in division programs, such as Drug Abuse Resistance Education, Seniors and Law Enforcement Together, the School Resource Officer partnership with the South-Western City School District, as well as its participation in Jackson Township Fire Department’s Safety Town. In 2011, connection with the community was further strengthened through the development of the Citizens Police Academy. In late summer 2019, participants in the division’s 12th CPA class will learn the goals, objectives and operations of Grove City’s police force. Sessions cover topics including laws of arrest, search and seizure, and traffic crash investigations. Participants are encouraged to ask questions and offer community insight to division personnel. The Citizens Police Academy Alumni Association provides thousands of volunteer hours to division programs including the Community Watch Volunteer Program. The Grove City Division of Police is continually building relationships with the citizens they protect, fostering a commitment to public safety. 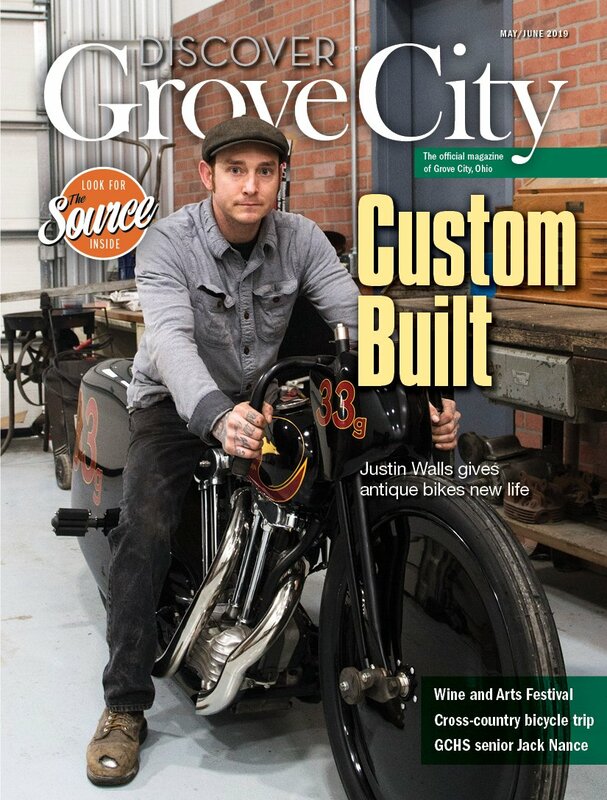 It is this spirit of community that makes Grove City the perfect place to live and work. Gary, Mike and Tyler Hammel. Mike’s son, Tyler, joined Concord’s workforce in 2015, making up three generations in the business. With an emphasis on finding, hiring and retaining qualified tradespeople in a competitive labor market, Gary Hammel, co-founder of Concord Fabricators, Inc., and Mike Hammel, vice president, are quite appreciative of the Welding and Manufacturing program offered at the South-Western Career Academy. Over the past five years, Concord worked closely with the school’s Welding and Manufacturing students and staff, creating and perfecting a program that provides on-site mentoring opportunities for 15 high school juniors and early employment placement for eight seniors – essentially resulting in several full-time positions at Concord for graduating seniors through 2018. While working to create the mentoring program, Concord Production Manager Andy Hoy toured SWCA’s welding lab, participated in bi-annual advisory committee meetings and met with school instructors to share information about Concord’s training and employment needs. SWCA’s welding and manufacturing instructor Katie Rucker spent time getting acquainted with staff at Concord by touring the facility, witnessing the type of product and service it provides. It is this thorough collaboration and dialogue where the latest industry trends, skills and demands can be shared between businesses and educational providers. Gary Hammel, co-founder, and Mike Hammel, vice president of Concord Fabricators, Inc. Founded in 1988, Concord first began fabricating steel at a 30,000-square-foot facility in 1993. The company quickly became a predominant steel fabricator and supplier, contributing to numerous commercial, medical and institutional projects throughout central Ohio, shipping over 5,000 tons of structural steel annually. Co-founder Gary Hammel, along with his son and company Vice President Michael Hammel, oversees the day-to-day operations and management of their 30 employee workforce. SWCA senior Jeramey Dunlap (left), SWCA graduate/current Concord associate Dustin Schleppi (center) and Concord Production Manager Andy Hoy. Structural steel is commonly used in the construction of commercial buildings due to its characteristics of strength, durability, sustainability, fire resistance and its ability to be recycled and reused. Concord is considered a one-stop shop that welds, cuts, forms, machines and ships the steel to the project and has produced steel for numerous projects in Grove City, including the new OhioHealth Grove City Methodist Hospital, the HPLEX/Orthopedic One medical office building, as well as Home2Suites and Tru by Hilton Hotels. While discussing Concord’s past and future projects, Mike Hammel commented that Concord provided the steel for Grove City’s City Hall building and he personally produced the shop drawings for the project by hand.